In our daily life, we click hundreds of pictures and save them to view on the big screen. So, image viewer software has gained popularity. Although Microsoft Windows has built-in apps for that, they were only good till windows 7. As windows 7 contained Windows Photo Viewer which was fast, but with the update in windows, Microsoft has changed its photo viewer in windows 10. Many of you might be satisfied with Windows Photo application of Microsoft, but most of you complain about its slow loading time. You are forced to use it unless you have any other option. So, we are here to recommend you some top-ranked Photo viewers. Whenever we talk about Photo viewing software, Windows Photo Viewer will be our priority. Windows photo viewer is a simple application that has a user-friendly interface. There is easy access to every function, i.e., zoom, rotation, slide show, etc. Although it has limited editing options, still it was fast and reliable. But now you will think that its been removed from windows 10, how to use it. The answer is straightforward, developers did not remove it from the OS, but they have hidden it. Now you have to get access to it. Accessing it, is simple. If you have upgraded your windows to windows 10 then you need to go to system default applications there you will find Windows Photo Viewer under Photo Viewer. Just change it, and you are good to go. But if you have installed Windows 10 from scratch, you need to download registry file, and you will be able to access it. HoneyView is not a built-in software; in fact, it is third party software. It is freeware hence you don’t need a license or activation key. HoneyView not only supports regular image format i.e. BMP, JPG, GIF, PNG, PSD, DDS, JXR, WebP, J2K, JP2, TGA, TIFF, PCX, PNM but also raw formats i.e. DNG, CR2, CRW, NEF, NRW, ORF, RW2, PEF, SR2, and RAF. Apart from that it also supports for viewing the location of GPS-tagged Photos on Google Maps. The main feature of HoneyView is that it can display EXIF in JPEG format. It also contains basic photo editing options. So, for basic photo editing, you don’t have to consult Photoshop. It resembles Windows Photo Viewer but with little advancement. Irfan View is not only one of the best but also one of the old photo viewing software in the market. Old doesn’t mean that it is not compatible with windows 10. Its user-friendly interface gives ease to the user for understanding its functions. It has been used over the years and still being used in the market due to its lightness and supporting a variety of photo formats. Its essential feature includes a slide show, quick browse, built-in photo editor, batch file converter and a scanner interface. It also supports OCR to read image text and export it to editable text. It almost supports all image formats. Another plus point is that it can be expanded using plugins. One of its drawbacks is that while scrolling through images, it keeps trying to load non-images. However, it can be settled using the setting. FastStone is another third party freeware software for image viewing as its name suggests that it is fast and light software. FastStone is not only a photo viewer but also image browser, image editor and image converter. It supports almost all image formats including RAW formats. Primary editing option includes cropping, rotating, resizing your images. Its Drag/Drop, Copy/Move feature make it easy for the new user. For a large number of images, FastStone has Multi-Monitor configuration. Apart from its portability feature, you can also attach files directly to email. Its Batch renaming and Batch Conversion feature make it superior to all. But it becomes a little slow while dealing with batch files. If you are looking for photographer’s toolkit, you might be interested in XnView. 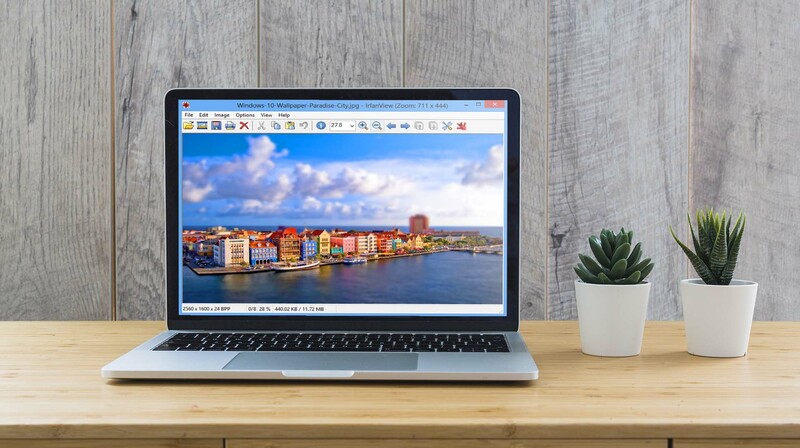 XView offers not only image viewer but also organizer and editor. It supports more than 500 image formats. Its photo editing feature allows you to use all primary editing feature along with some extended features. Photo editing feature includes Resize, Rotate, Crop, Lossless Rotate & Crop (jpeg), Adjust Brightness, Contrast, Auto Levels, Auto Contrast, Modify Colors depth & palette, Apply filters & Effects. Which means half of Photoshop has was embedded in it. Batch processing is another feature that XnView is offering to its users. With batch processing, any of the operations can perform on a group of files, i.e., resizing, watermarking, overlay text, etc. This process saves time and energy. Apart from that if you want all in one software, XnView is the only one. If you have used Lightroom, then you might feel ACDSee useful. ACDSee is another old program that was updated over the years. In the last update, many of its features enhanced. Its interface has become friendlier than ever. One of the best features that have been added is that it can look at the images inside zip files. So, you don’t need to use extra space for extracting it. Its organizing mode allows you to find pictures by date, rating and other user assigned tags. ACDSee also enables you to use batch processing facility. Editing photo facility is also available in ACDSee Ultimate. Necessary editing tools that are available for the user are cropping, red-eye removal, resizing and 54 special effects, adjust color, hue, saturation, and contrast. But the drawback of editing is that it doesn’t allow you to work on layers. Another critical feature of ACDSee is that it will enable you to share your photos on social media directly. So you need to edit and click the share button. Apart from that, it’s costly as well. QuickLoookk is another user-friendly application that is used widely for previewing photos. Once your PC is booted, QuickLook was launched. You can press “Spacebar” to preview the file content. And if you want to close the preview press “Spacebar” again. When it comes to previewing a word document, it fails, but text files can previewed. Multiple formats supported by QuickView including images, videos and text files. Its lightness makes it quick and responsive. QuickLook application is only available for Windows 10 and is also available in Microsoft’s store. You will find little bugs in QuickLook as it is still under development and updated on intervals. QuickLook is simple and easy to use. Nomac is a freeware software with clusters of features. It is open source and is compatible with every type of system. Its image viewing feature supports almost all file formats including RAW and PSD. Its user-friendly interface shows you additional information like thumbnails, metadata or histogram, etc. Its Multiple Instance synchronization features allow you to compare images by zooming or panning at the same position. Additional features include viewing images from zip archives, viewing MS Documents and adding notes to images. Along with the essential editing feature, some other editing features are offered by Nomacs which includes adjusting brightness, contrast, saturation, hue, gamma, exposure. You can apply filter within the directory so that required showing images. Now you can get rid of your default Photo Viewer. As every software has its pros and cons, so you can try each one of them, or you can go through the description and select that satisfy your needs. Now the ball is in your court. Do share your thoughts on best image viewer for Windows 10 in the comment section below. Next articleHow Do I Get Started With Home Automation?